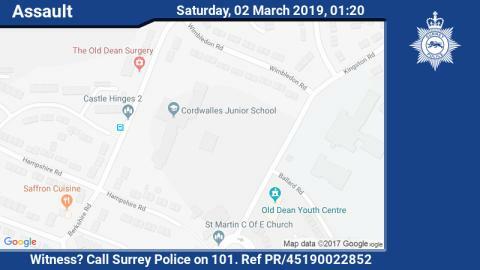 At around 1.20am on Saturday, 2 March the victim was walking along an alleyway from Berkshire Road towards Kingston Road, when he was approached by three unknown men. The three men shouted verbal abuse at the victim before assaulting him, resulting in facial injuries. The suspects then left the alleyway, heading towards some nearby shops on Upper College Ride. All three men are described as white, between 20-23 years old and around 6 foot tall. If you saw or heard anything on Berkshire Road, or you have any information about this incident, call us on 101 quoting the reference number PR/45190022852. If you live nearby and you have CCTV outside your property, you may have caught something. Likewise if you were driving on Berkshire Road at this time and you have a dash cam, you may have caught something, so please get in touch. Alternatively you can report anonymously to Crimestoppers by calling 0800 555 111.